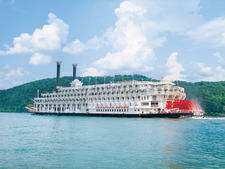 American Queen Steamboat Company specializes in paddlewheel cruises on U.S. rivers, including the Mississpipi, the Ohio and Tennessee, and the Columbia and Snake rivers. The line, which originally launched as Great American Steamboat Company, began operating American Queen in April 2012 and has since added two more riverboats, with a third coming in 2029, bringing the fleet to four. The company, which purchased Victory Cruise Lines (and its two exisitng ships and one to come in 2021) to add Great Lakes and coastal cruising to its itineraries in 2019, is affiliated with HMS Global Maritime, founded by John Waggoner. American river and coastal line debuted in April 2012. 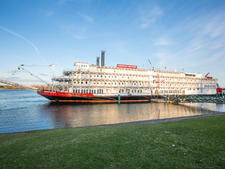 Three-ship fleet includes world's largest paddlewheel steamboat. Inclusive pricing: dinner drinks, tours, Wi-Fi. In April 2014, American Empress joined the fleet after undergoing a major refurbishment; it sails in the Pacific Northwest on the Columbia and Snake rivers. American Duchess was added in 2017 as a luxury option. 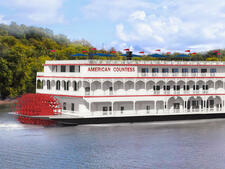 In 2020, the line's fourth paddlewheel boat, American Countess, will join the fleet with more Mississippi River cruises. In November 2018, American Queen Steamboat Company purchased Victory Cruise Lines, has since added four more boats, with a fifth coming in 2019, bringing the fleet to six. The boats will keep their current names, Victory I and Victory II, with the addition that they are operated by AQSC. Victory is adding an Alaska charter in 2021. American Queen Steamboat Company is headquartered in New Albany, Indiana, which is just across the Ohio River from Louisville, Kentucky. Company President and CEO John Waggoner, who serves as a board member of the Kentucky Derby, regularly enters his boats, including American Duchess, in the Great American Steamboat Race. American Queen Steamboat Company's American Queen, launched in April 2012, and American Empress, launched in April 2014, are decked out in regal Victorian elegance. Think ornate chandeliers, rich upholstery, brass as far as they eye can see and polished wood. Both ships are filled with modern amenities, too, such as Wi-Fi in public spaces, but the aim is to evoke memories of the stately river steamers of the 19th century. Antiques and fresh flowers provide the ambience of an antebellum mansion. The line employs resident expert "riverlorians," who tell the stories of the towns and hamlets visited, both via in daily lectures and one on one -- they're very visible on the ship and will answer questions virtually any time. Both ships have libraries that offer fiction as well as nonfiction written about the histories of the areas visited. To add a little zest to the stately vibe, both ships carry bikes, providing passengers a chance to peddle through the river towns they visit. On the dining front, the menus reflect regional cuisine: New Orleans and modern Southern comfort food on American Queen, fresh seafood and bright berries on American Empress. Decadent delights on American Queen include items such as sugary beignets, corn and shrimp fritters, and molasses glazed pork loin stuffed with Andouille sausage to satisfy passengers' appetites. On American Empress, passengers will eat pan-seared scallops, Indian rice soup and steamed cold-water lobster tail. Dining venues include alfresco options and no-fee specialty options. No formalwear is ever required, even for dinners, where complimentary wine (sourced from the Pacific Northwest) and local beer are poured. Shore tours, included in the fares, provide immersion into the history, culture and cuisine of the heartland. The ships feature a professionally trained, all-American staff. Expect well-traveled passengers, ages 50 and older, who enjoy Victorian charm, antiques and dancing to swing or big band music. American Queen Steamboat Company draws history buffs and culture connoisseurs, as cruises provide an in-depth look at history and cuisine. The line expects slightly younger crowds during holiday and summer itineraries. Passengers are loyal to the line, so crossover between the two ships is common. American Queen is the largest steamboat in the world, with the capacity to carry 436 passengers. The boat was purchased in August 2011 from the U.S. Maritime Administration (MARAD) for $15.5 million. Originally built in 1996 for the defunct Delta Queen Steamboat Company, American Queen had been laid up since 2008, when its most recent owner, Majestic America Line, went bust. Before relaunching in April 2012, American Queen received a $6 million spruce-up to make the Victorian decor -- chandeliers, upholstery, polished wood throughout -- pop. Cabins got new bedding and flat-screen TVs, and a top-deck dining venue was added. In early 2013, the company made additional refurbishments to public areas, such as the J.M. White Dining Room and the Front Porch buffet venue. In 2013, the company announced it purchased Empress of the North from MARAD and subsequently renamed it American Empress. The 223-passenger ship sails the Pacific Northwest (on the Columbia and Snake rivers). A major refurbishment added the Victorian touches that define the company -- lots of chandeliers, lace curtains, opulent wallpaper and ornate, dark wood furniture. Of course, it also got some modern amenities, including shipwide Wi-Fi, flat-screen TVs and Keurig coffeemakers in cabins and Bose entertainment systems in suites. Public spaces were also completely revamped, most notably the River Grill & Bar, an upscale dining spot with cool al fresco option. Launched in 2017, the 166-passenger American Duchess still has the white wedding cake exterior of a traditional paddleboat -- and a working paddlewheel that does add some speed to the vessel -- its interior is refreshingly modern and contemporary.The airy design comes from the ship itself, which originally served as a gaming boat with lots of open space. American Duchess is wider than other ships in the AQSC fleet at 100 feet, and has ceilings on each floor that are 18.5 feet tall. When you walk into the ship, the spaciousness is immediately apparent and it's highlighted by atrium staircases that go up two floors -- 37 feet in total. The ship also boasts large loft-style cabins. American Countess will launch in 2020. The former casino boat Kanesville Queen, American Countess is being stretched and completely redone, in a traditional style, with the addition of a paddlewheel. It will be geared toward groups, with smaller lounges being built. American Queen and American Duchess cruise the upper and lower Mississippi, and the Ohio and Tennessee rivers on five- to 14-night sailings. Cruises depart from New Orleans; Memphis; St. Louis; St. Paul, Minnesota; Cincinnati; Pittsburgh; and Chattanooga, Tennessee, among other places, and themes include Civil War Vacations, Epic Civil War, Springtime on the River, Old-fashioned Holiday Vacations, Southern Culture, Music of the 1950's, Baseball Legends, Blues and Bourbon, and Fall Foliage. The boat is laid up between early January and early February. Upper Mississippi cruises explore towns shaped by early explorers and American Indians, such as Joliet, Illinois; Red Wing, Minnesota; and Dubuque, Iowa. Lower Mississippi cruises explore what was once the dividing line between warring North and South. Columbia and Snake River cruises are 8-night trips that take in Lewis and Clark country in the Pacific Northwest. Ohio and Tennessee rivers cruises recall the great wilderness through Bluegrass country, once the territory of Davy Crockett, Daniel Boone, the Cherokee and the Chickamauga. Seasons and holidays are also recognized with themed itineraries. 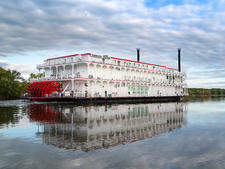 Cruises celebrate Independence Day, Thanksgiving, Christmastime, Mardi Gras and fall foliage along the Upper Mississippi. American Empress sail the Columbia and Snake rivers. Eight-day itineraries will take passengers from Portland, Oregon, or Vancouver, Washington, to Clarkston, Washington, or from vice-versa. Passengers will follow along in the footsteps of explorers Louis and Clark though some of the most scenic areas in the world. Wildlife plays a major part in these cruises; you might see soaring bald eagles or masses of sea lions. Wine, of course, is also a big part of cruises to the Pacific Northwest, so port stops will include visits to wineries throughout the region.